November | 2013 | Adventuring Towards . . . I did it! I completed my New Year’s resolution of reading Vida de Pi (Life of Pi, in Spanish) in 2013. In fact, I finished a month early. This is the second year in a row that I’ve read a book in a foreign language, and I think it’s been so helpful to me in maintaining and even improving my languages. Last year, I read the first Harry Potter book in Chinese, but that was a little bit different as I had already read part of it in 2011. Even so, I found myself scrambling at the end, and I think I read the last third in the two weeks I was home on break :( This year, I did the whole thing, start to finish, in 2013, and I made a couple improvements that I think really added to the experience. First of all, after I realized that reading Harry Potter in a year would have meant reading ½ a page every day if I had been disciplined, I decided to be more consistent in the task throughout the year. To that end, I started using an online service called Beeminder. They describe themselves as “goal-minding with teeth” – essentially, you commit to a goal and if you fail to make it, they charge you. (There are several caveats; you can change your goal anytime but the change takes effect a week from now, and you don’t get charged for the first “derailment”.) It’s a cool service and I highly recommend it for anything that you’re looking to track but also commit to. I think there are a couple of interesting things to notice from this. First of all, I started the year by reading almost every day, but by June or so I was in a pretty solid pattern of reading 7-8 pages on the weekends. This ended up being more efficient and, to be frank, realistic. Also, look at the outlier right around the beginning of October – I had a friend coming to visit me and I knew I didn’t want to have to read while he was here, so I got well ahead in my reading before he came. This is totally due to Beeminder; without it I would have fallen behind and had to catch up, but this commitment made me be proactive! The second thing I did also involved data tracking. Throughout the book, I kept track of the words I underlined (the ones I didn’t know and had to look up) as well as the words that I added to Anki (my flashcard program). I started using Anki with Spanish at the beginning of the year, so it was a very clean slate to start with. 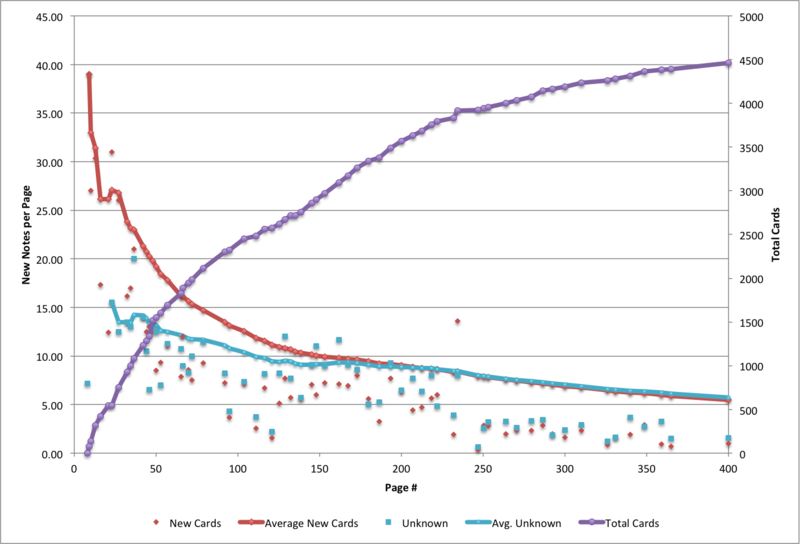 The red line and dots are the new cards that I added to my flashcard deck. At the beginning, I added a lot of easy words that I already knew in Spanish, just so my deck wouldn’t be overwhelmingly hard and discouraging. (Also because I think it’s an interesting concept to quantify the number of words you know in a language.) This tapered out quickly, and had been reduced to almost nothing around halfway through the book, when it joined the torquoise line. The torquoise line and dots are the words that I underlined and had to look up. Around halfway through, the torquoise line and the red line joined, meaning the only cards I was adding to Anki were words that I had had to look up. At the beginning of the book, this was almost 15 words per page! By the end of the book, I was reading much faster, and part of that was because there were only a few (<5) words on each page that I didn’t know. It’s also interesting to note the outlying data points . . . that red dot around page 240 is when Pi started fishing, and I learned a lot of words for fish and fishing equipment. The turquoise points around 150 are when Pi first got into the lifeboat and I encountered a lot of terms for parts of the boat and the supplies that he had with him. I thought all of this was really interesting, and definitely worth the extra effort in tracking the information. Sadly, this is not even close to the nerdiest Excel spreadsheet on my computer. Not. Even. Close. 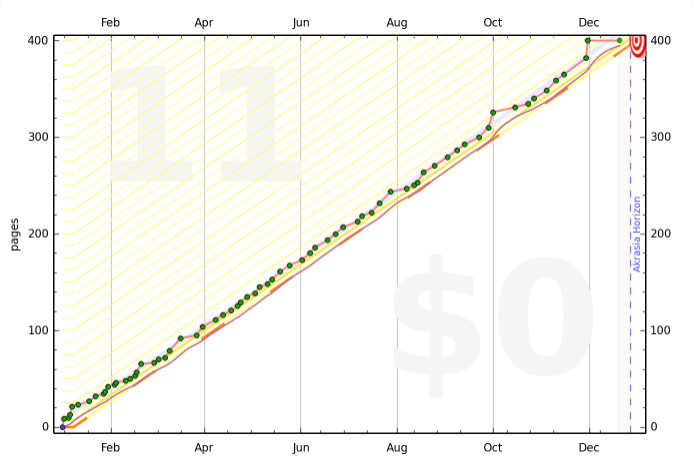 So, with 2014 a month away, I am starting to think about next year’s goal. I want to continue in this vein somehow, but I’m torn between languages, books, and even mediums. I feel ready to read something originally in Spanish that I haven’t read yet, but in Chinese I would stick with something I’ve read before (probably Kite Runner, because I already own that). I’m also considering a telenovela, to really work on my listening in Spanish more . . . We’ll see!